Follow orphan Eva on a trip to mystical Prague in Alchemy Mysteries: Prague Legends. After a relative's mysterious death, Eva inherits an ancient house in Prague. Knowing nothing about her past, she goes looking for answers. There she uncovers secrets about the house, her family and an insidious plan of the black alchemist. A wonderful and dangerous adventure is about to begin. 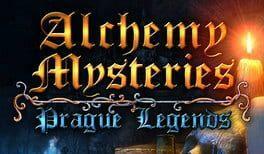 Alchemy Mysteries: Prague Legends is available from 4.31 to 9.99 from 2 shops.